Last night was a beautiful, beautiful full lunar eclipse. Being on the east coast on New Zealand, we had front row seats for this rare occurence. So after a date night in town, my boyfriend and I drove out of the city to the southern beaches, pulled up the car by the sea, and waited. We’d been wondering whether the cloud cover would be too much to see anything, as the last few days have been cloudy, but it was perfect. 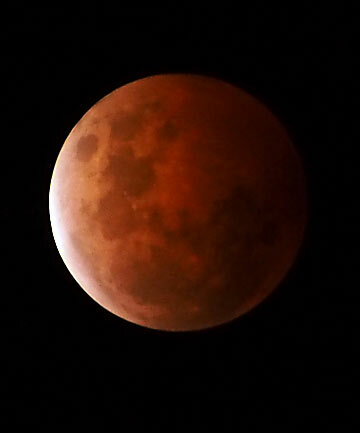 We sat and watched as the earth’s shadow swallowed up the moon bit by bit, with a glorious ring around the moon, then the whole moon turned slowly to blood red, the “blood moon” that this phenomenon is named. Once the eclipse was over, the cloud cover came back. It was as though the curtains were drawing back across the stage, the show over.